There has always been something unconvincing about the mythological stories we heard in the laps of our elders. We were told that these stories were parables which taught us essential values, reliable maps devised by our ancestors to help us navigate through the journey of our lives. However, we never took them seriously, as our messy, complicated lives didn't fit with moral stories of good winning over the bad. 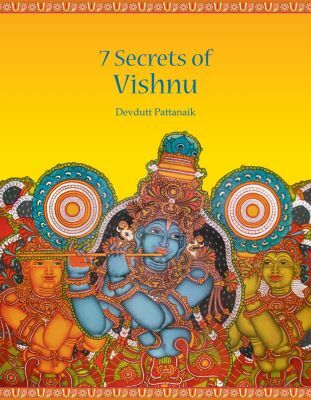 With his brilliant research and lucid writing, Devdutt Pattanaik, in his latest book on the 7 secrets of Vishnu, debunks our naive understanding of mythology. As he writes in an article elsewhere, mythology isn't prescriptive, but reflective, helping us shape our view of life. He further attributes it to "the poor english translations of Hindu Mythology in the 18th century" which reduced the beguiling beauty of these stories into monochrome stories of good triumphing over the evil. As I began unraveling the secrets of Vishnu, I realized that Devdutt, with his insightful work is not just a mythologist, but a mathematician of the higher-order, showing us the complex patterns behind the rich symbols of our folklore. As he begins the book, he sets out his objective to discover "explicit patterns" that are implicit in the stories, symbols and rituals". In the year 1975, Polish-born mathematician Benoit Mandelbroit, coined the term fractal, to describe intricate design shapes, based on mathematical constructs, found in various creations of nature, right from clouds & mountains to ferns and cauliflowers. Mandelbroit famously wrote, "Clouds are not spheres, mountains are not cones, coastlines are not circles, and bark is not smooth, nor does lightning travel in a straight line ". Perhaps, the same could be said for Lord Vishnu and countless gods in the Indian pantheon, as we look closely, beyond the superficial reality of forms and actions, we discover hidden metaphysical principles constructed through various symbols. Why is tulasi plant grown at courtyard of the house? Why are temple walls adorned with intimate conjugal images? Why is Brahma, the creator of life, never worshiped ? ( save one rare shrine in southern India) ? The author answers several interesting questions and presents us with a fractal understanding of Hindu Mythology, over a panoramic purview, across the subterranean world of asuras to the supraneous world of Devas, swathing across the world of animals, abiding by the jungle law and humans, abiding by Dharma, cultural construct of the society. As we delve deeper across the patterns, we discover more intricate patterns which leave us dazed and forces us to introspect the nature of human affairs. However, the book never descends to the physical realm until the end and we hover over the metaphysical realm, at a safe distance, enamored by its beauty. To bring the metaphor into perspective, the mathematical equation, with its precise and powerful language, may help us understand the truth. The patterns may be exquisitely beautiful. However, it only approximates the truth. Towards the end, the author compares the human condition with the elephant king Gajendra, whose feet is caught held by the crocodile, symbolizing the agony over attachment to the material things. "In misery, we thrash about like Gajendra trying to get rid of the crocodile", the author describes the state of human affairs. Perhaps, as my favorite poet Kabir points out often in his various beautiful songs, we would be liberated not just when we rid ourselves from the crocodile of material attachment, but also from Lord Vishnu and our spiritual attachment. Thanks siddharth for the information. I am quite sure that there is one temple in south as well. I have heard from my mother who has been exploring temples for a while. I shall recheck with her and find out where it is..
Tamil Nadu and one even in Gujarat on the way to Mt.Abu. by Brahma from Shiva, Brighu, etc. single idea or figurine, then that is our deity. Surprisingly, Kabir's follower is reading and writing about Vishnu and talking about mythology and temples!! Strange!! That's an interesting thought. Our collective fears and hopes are often personified in our deities. I have been often puzzled by how Parashuram is treated as a Lord after his violence. Devdutt talks in detail about how lakes of blood were flowing after his blood bath in which he killed several Shatriyas, destroying one clan altogether. Infact, one spiritual leader, in his analysis over Dashavatar, said that if we can treat Parashuram as a Lord/Avatar, then we can call anyone a deity. Devdutt doesnt talk much about why we came to accept Parashuram as a deity. That would be an interesting conversation. Btw, wanted to get the feedback on the analogy with mathematics. Any thoughts? I know I haven't gone into depth while I wrote. Somehow I am little piqued with the idea that it would be worth exploring the parallels in detail, especially with respect to the fundamental principle of Self-similarity in Fractals. "Taaro raam hrudaya mein..baahar kyun bhatke..." Which Ram does Kabir refer here? Mythological Ram or someone else? I dont know where I am. You are right in pointing out my state. I am here and there. Waiting to see things clearly..
Definitely not the mythological Ram. The term, may be, is used so that we can relate to it easily. However, i m more concerned about DevDutt fellow here. He might be great in implementing stories to businesses, I have seen him on youtube bullshitting in the name of mythology. What i want to share is, ppl like him try to connect the sythetic dots and squeeze out interesting stories to tell, which are quite fascinating and attractive. The best part is, they themselves are convinced that whatever lesson they want to convey are just the way it is. Worst part, such people also invent stories in the name of mythology which are convincing enough that proves their point of view/lessons. This takes away the clarity and larger picture. While the fluid nature of mythology lends itself to various interpretations, having read Devdutt's works, I wouldn't totally agree on your comments. Only someone who has a shallow knowledge can simply superimpose his view points. Not an erudite like Devdutt with his intellectual energy! I say this having read his works and seen some glimpses of his amazing knowledge..i have nothing to gain from praising him, lest u have any doubts..
lol... the best part is - "he knows Vishnu's secrets; all 7 of them!!" rofl.. he alse knows "Shiva's secret; by chance they are also 7 in number". Venky, there is no difference between faith and blind faith.. both have no rational thoughts behind them. You are too carried away in the 7 secrets and convinced. Flow along with his intellectual energy, and only find yourself lost; cant say closer to away from God! Its precisely for this reason I mentioned Kabir towards the end. While we appreciate the beauty, art etc. of our ancestors, if we begin to get serious, we might want to question everything..God included..However, I am not learned enough to criticize somebody on his work. I am not writing this to sound politically correct. These are my honest observations. So I leave it at this..
one of those secrets of venky!